Flash storage is just exploding -- with capacity increasing and prices falling. Flash enables tiny devices, from portable music and media players to USB "thumb" drives -- now busting into multiple gigabytes of storage at affordable prices. USB drives come in a wonderful profusion of sizes and shapes, from amazingly tiny fingernail sizes, to bulkier and more rugged to endure the hazards of business travel, to blinged-out fashion accessories from USB knives to Disney characters. Lots of companies are entering the flash storage -- For example, SanDisk and Kingston are expanding from their core memory business; Verbatim, Imation, and Memorex from optical and other storage media; and Sony from consumer electronics. Another company that is trying something different with USB drives is RITEK Corporation, with its RiDATA brand of storage and accessories (also known as Advanced Media Inc., the American subsidiary). 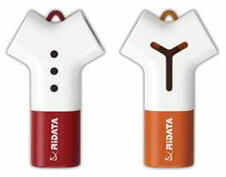 The RiDATA USB flash drives are exploring new ideas in packing up flash memory in fun and interesting designs -- interesting concepts like the USB laser pointer, choices of alternative designs like rotating and retractable USB connectors, and whimsical shapes like the Monkey and Elephant. But if storage is good, then more storage is better, so why stop at a single USB drive? Instead, RiDATA offers multi-port designs like this Yego EZdrive so you can chain together multiple drives, or even use a drive as a hub to plug in additional drives. Ulead VideoStudio 11 was released in April 2007, still focused on easy consumer editing with more automated assists for creating quick movies and snazzy-looking movie-style opening sequences. VideoStudio is also bulked up with the latest technologies, especially for editing high-definition formats including AVCHD, with Dolby Digital 5.1 surround sound, authoring to HD DVD discs, and exporting to portable devices like the Apple iPod and Sony PSP with MPEG-4 and H.264 format support. - The base Ulead VideoStudio 11 for capturing video and images from any source, editing movies, and sharing on tape, DVD and the Web (USD $89.99 suggested retail). - The full Ulead VideoStudio 11 Plus with MPEG-4 support, new high-def technology (HDV, AVCHD, HD DVD, Dolby Digital 5.1 surround sound), enhanced portable device support (MPEG-4 and H.264), and the full set of easy corrective and creative filters ($129.99). You can download trial versions of VideoStudio and related applications over the Web, so go ahead and give it a try. See the Video Editing Software Gallery with related products, consumer and professional. Check out Corel / Ulead VideoStudio 11 on Amazon.com. Now that mobile phones are encroaching into the domain of media players with downloadable and streaming music (see the impending Apple iPhone), it's only fair that media players return the favor by also becoming connected devices. For example, the SanDisk Sansa Connect is a flash-based music player with WiFi connectivity, but focused on subscription music. Users with a Yahoo! ID can listen to Internet radio, browse Flickr albums and photos, and see what friends are listening to. And users with a Yahoo! Music Unlimited subscription can download tracks and albums, and receive song recommendations from friends. Meanwhile, Archos has been developing fill-fledged portable video players with full WiFi access, including Web browsing and access to files on your local network. Yes, you can check your e-mail from your media player, and stream videos wirelessly from local computers or Internet sites. I've had a chance to try out the Archos 704-WiFi, part of the Archos generation 4 product line -- larger-screen portable players with hard disk storage for serious video clips, plus models with wide screens, massive storage, build-in camcorders, and WiFi. The Archos 704 is focused on video playback, with a large 7-inch widesceen color display (800 x 480) and stereo speakers below to share the fun. There's even a kick-stand in the back so you can stand it up on a table. Plus, the 704 sports a touch screen interface, so it has a very clean design with a minimum of buttons. It's available with an 80 GB hard drive for $549.99, to store up to some 40,000 songs, 100 movies, or 800,000 photos. Just be aware that this is not a cute little player to carry in your shirt pocket -- it's 7.05 x 4.96 x 0.78 inches, and weighs a noticeable 22 ounces. It's powered by a removable Lithium-Ion Polymer battery, and rated to run for up to 25 hours of music playback and 5.5 hours for video. See more in the Portable Media Players Gallery, under Hard Disk Video Players. 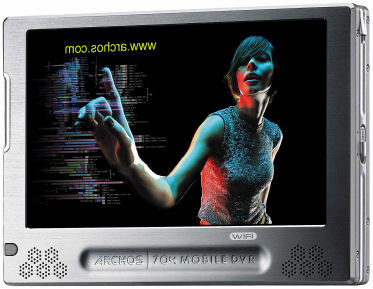 Check out the Archos 704-WiFi on Amazon.com. After further discussions with Archos, it's become clear that the Archos 704-WiFi supports wireless playback of media files only from files on a local network, and not over the Web using the Opera Web browser -- but the details are a bit odd. To play files over the network, place them in a shared folder on a networked Windows machine. From the 704, use the file Browser application (not the Opera Web browser) and tap on Network to view available shares, listed under the Windows workgroup name. Then tap the networked machine and then shared folder name to browse and play stored media files. However, when surfing the Internet with the Opera Web browser, there's no built-in support for playing media files over the Web. If you click on a link to a file with a known image file format like JPG or GIF, it displays the file. If you click on other file formats it recognizes like PDF and WMV, it offers to download them, so that you then can play them back locally. But if you click on a link to a media file with an unrecognized media format, the browser happily displays the contents of the file as if it was a Web page -- showing all the binary data as unprintable text. That can be a long download ... and there's no obvious list of which file types are handled in which way. Oddly, there's no general way to check what a link points to, and then specify that you want to download the target of a link -- even though the software is already capable of downloading files. So you can view image files, but not download them; and you can download some video files, but not view them directly; and you can't download files that the browser does not recognize. Entries posted to Manifest Tech Blog in May 2007, listed from oldest to newest.